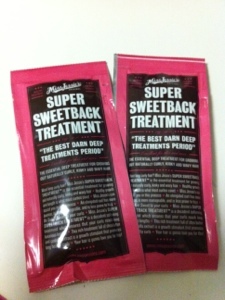 Yesterday I received my two sample packs of Miss Jessie’s Super Sweetback Treatment. I had already decided I was going to revisit the Naptrual85 wash & go method (see video here) that worked out quite well before. A friend at work said to me “Why don’t you just wear your hair natural? Every time you try to straighten it or something, it ends up reverting anyway.” She made an excellent point, which is what made me decide to go curly. I was a bit hesitant about trying another Miss Jessie’s product because of what happened last time, but I went for it anyway. For starters, I love love love the scent of it. The directions say that you should leave it in for 30 minutes. I got caught up on the phone and ended up leaving it in for 1 hour. When I rinsed it out, my hair felt AMAZING! I was pleasantly surprised. The last time I tried this wash & go method, I felt like my hair needed a little moisture, but it was hard to moisturize it and not disturb the curl pattern. To overcome this, this time I took a big bowl of warm water and I mixed a small amount of olive oil in the water. 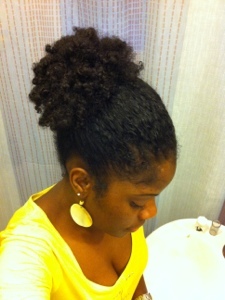 Once I rinsed all of the conditioner out of my hair, I poured the bowl of olive oil water over my head. These are the results after my hair dried. « How is this possible?